This tutorial was one of the most difficult and longest tutorials I have ever created! It started with over 2000 photos, and after spending a few weeks reviewing each photo, I was able to reduce it down to just under 100. It will be the longest tutorial currently on this site, but each photo is needed to give the level of detailed instruction my readers have come to expect from my site. 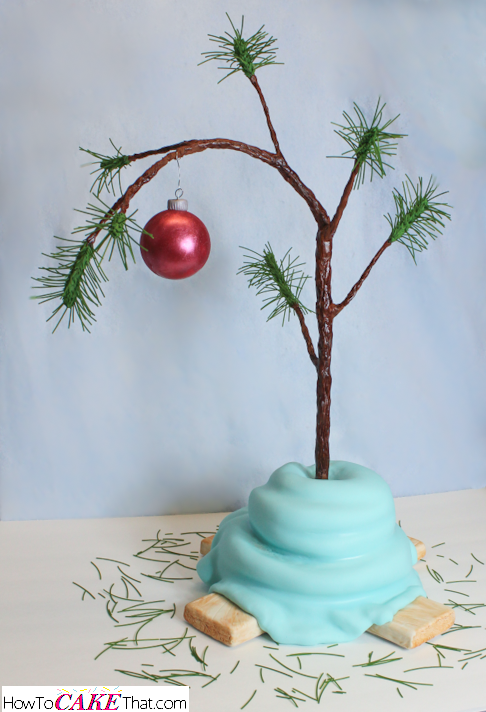 Originally this tutorial was going to be my first tutorial for sale in my shop, but in the Christmas spirit of giving, I decided to offer this tutorial for free, and just offer my new easy pine needle technique for sale in my shop ;). I hope you enjoy!! Okay, let's begin our tutorial! The first thing we need to do is to make the cake base! Here I am using a large foam core posterboard that I purchased for $1 from my local Dollar Tree! 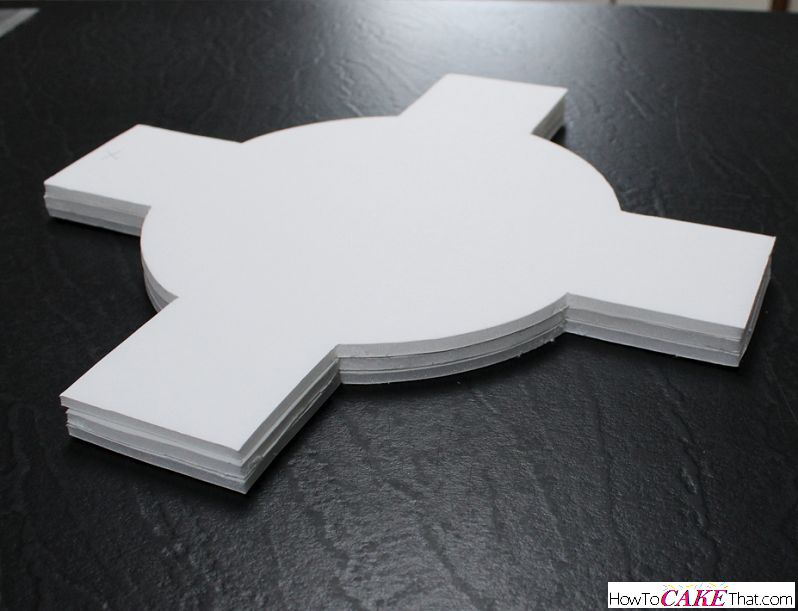 You can purchase foam core boards just about anywhere office supplies are sold, but they can be very expensive! 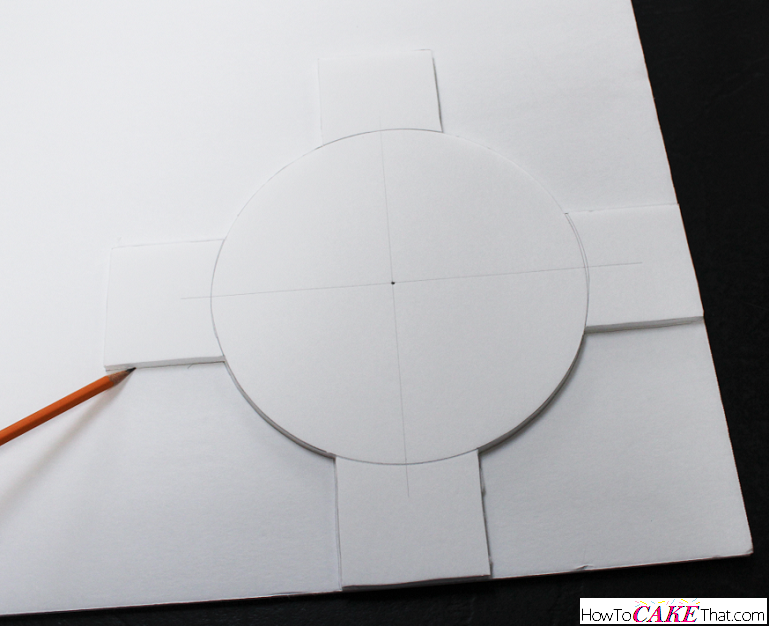 To begin, I place an 8" cardboard cake round on the posterboard and traced around it with pencil. Notice how the cake round sits back several inches from the edges. This will allow room to add the feet. Next, I marked where the center is on my circle. Then I used a ruler to create two intersecting lines to divide the circle into fourths. 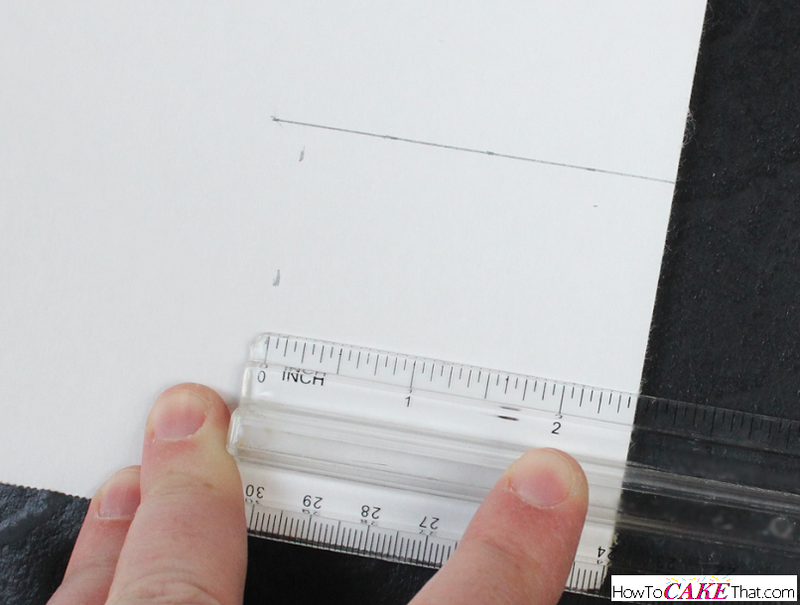 Next, on a corner of my foam core board, I measured out a rectangular piece that measured 2 3/4 inches by 2 1/2 inches. This little rectangle will be our template to make the wooden feet under the tree. 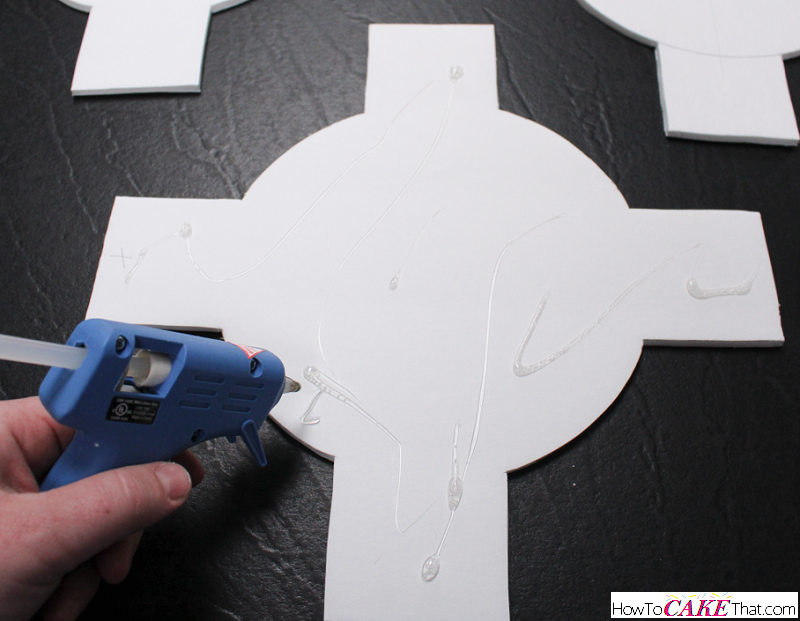 Then I cut my template out using an Xacto knife. 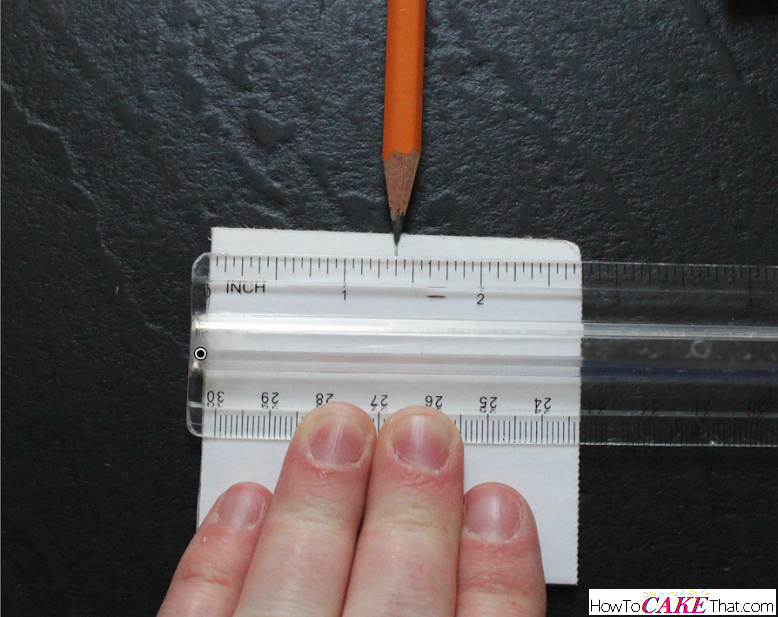 I lined up my ruler on the end that measures 2 3/4 inches and marked exactly where the center is. 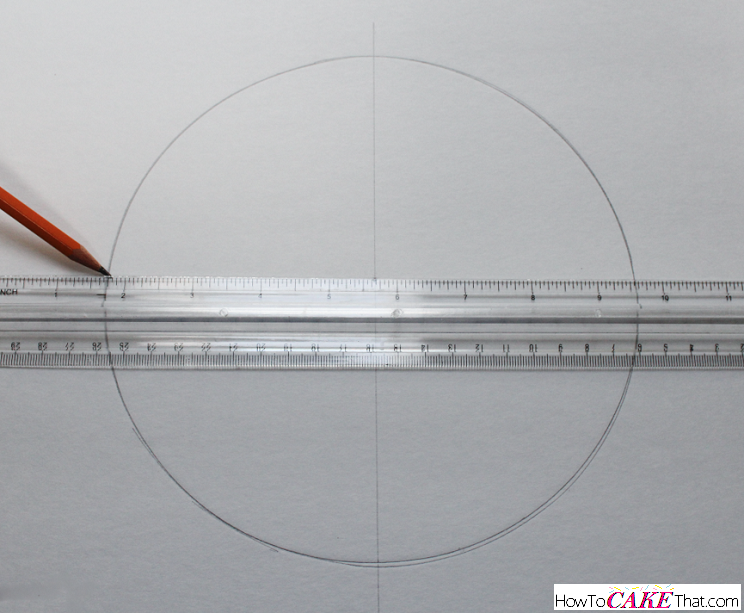 To line up where the feet should go, I placed my rectangle template on the circle and lined up the center lines. 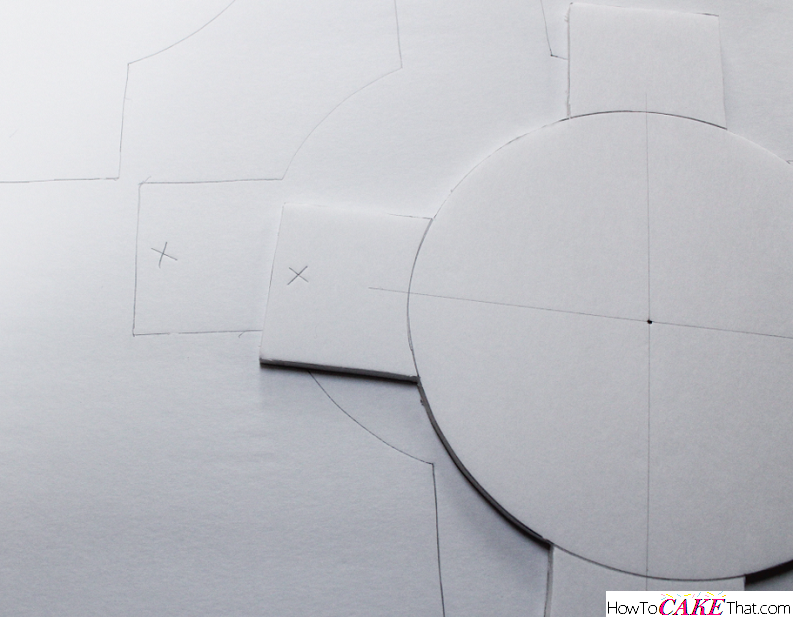 I ensured the corners of my template touched the circle, so there would not be any gaps when I trace around the template. Then I used a pencil to trace around the template. I repeated this on the remaining 3 lines. Then I used an Xacto knife to cut out the cake base. By itself, this cake base is too thin to hold a heavy cake. 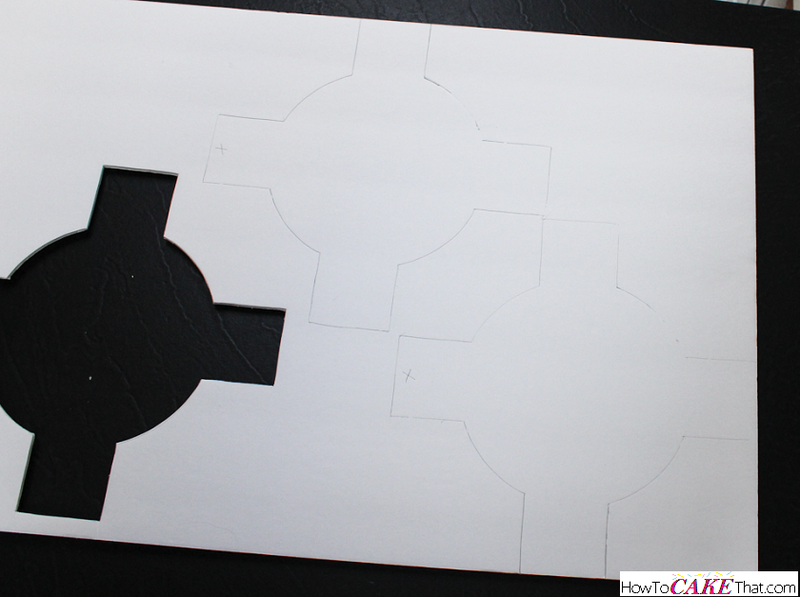 So we will use this first piece as a template to trace and cut out 2 more bases. 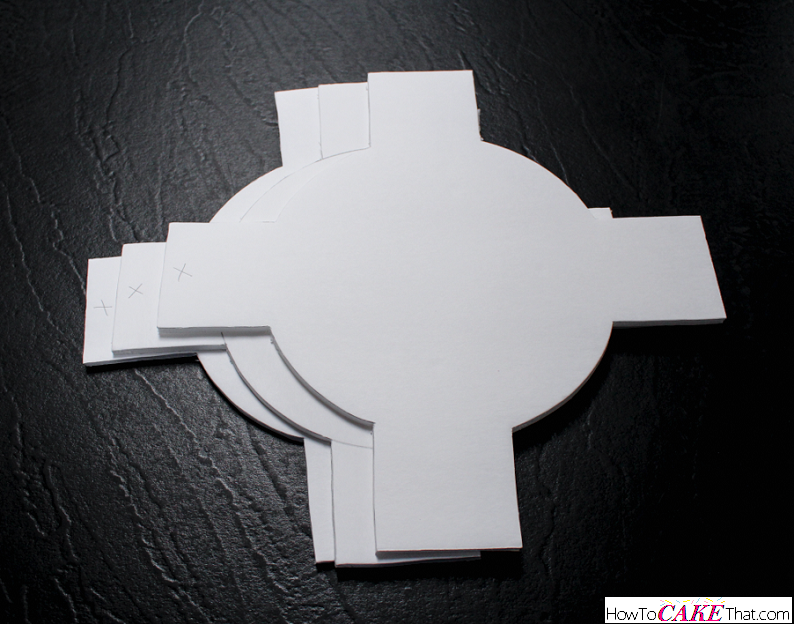 If the cake base is carefully lined up, the remaining two cake bases will fit on a single poster size foam core board! 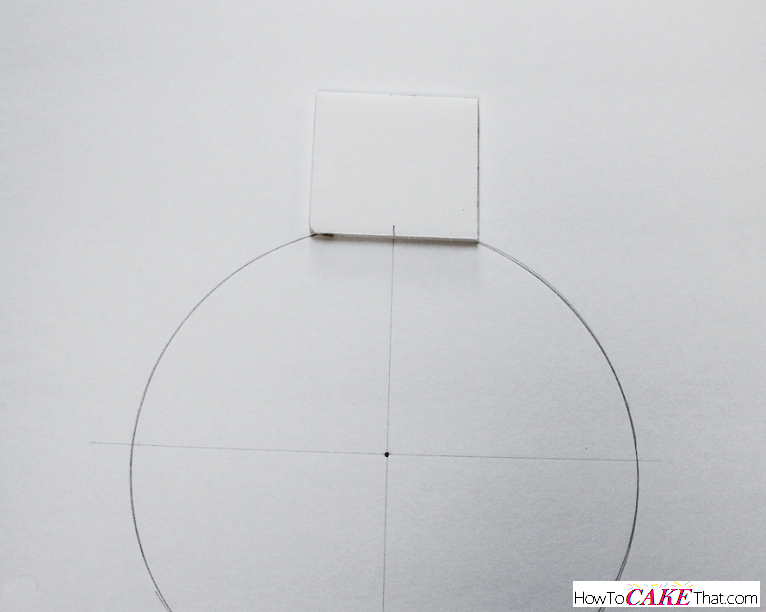 For easy straight edges, line up two of the cake base's feet on the edges of the board and trace around. 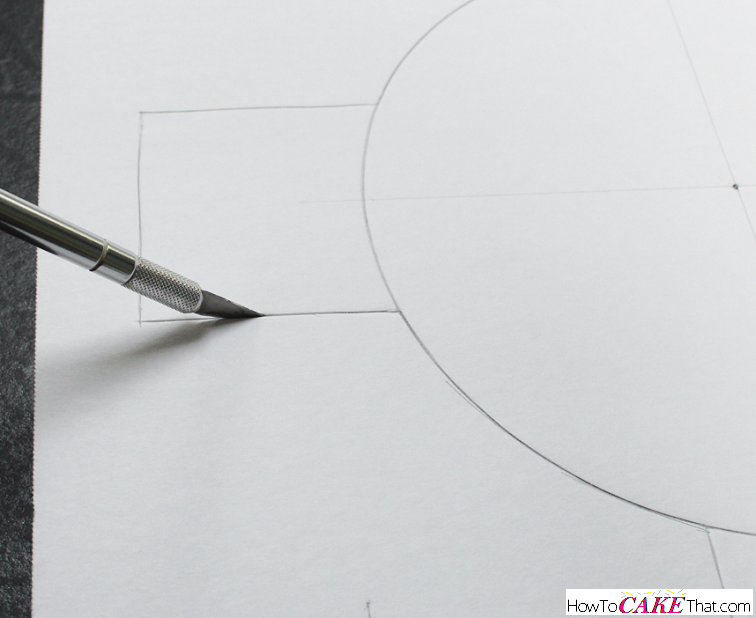 Since the feet may not be perfectly lined up on the original template, mark an "X" on one of the feet, then copy that X on the same foot of your remaining cake bases. 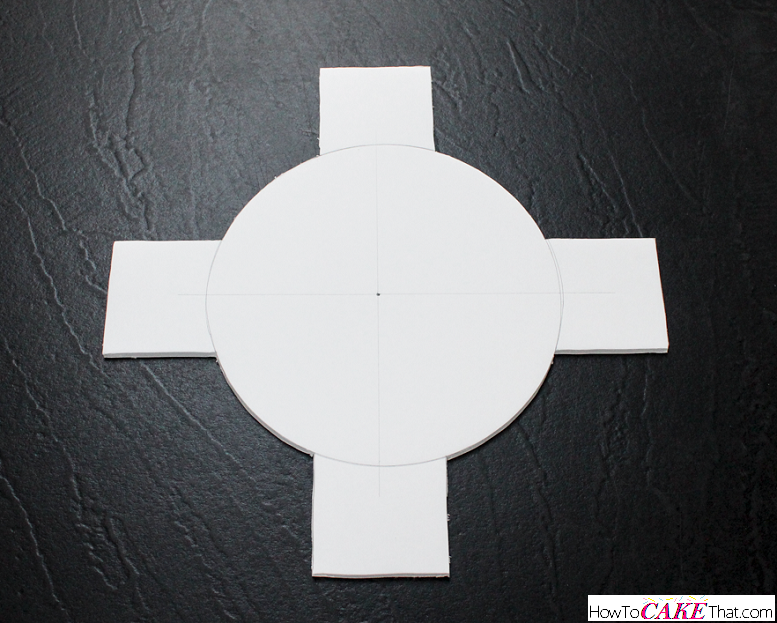 This will help ensure the bases line up easily and fit perfectly. Check that out! All 3 fit on a $1 board! Yes!! 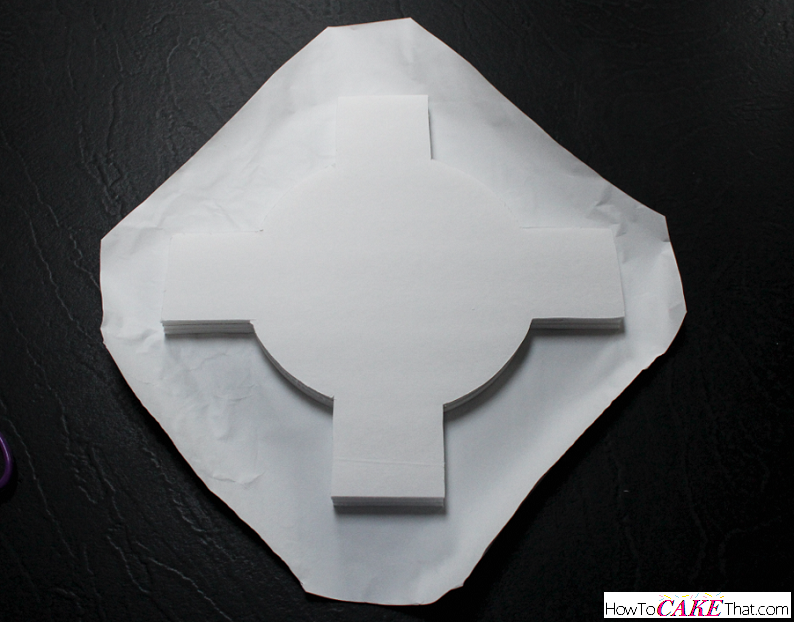 Stack the cake bases, ensuring the X's line up and make sure everything fits perfectly before gluing them together. Next, I used a hot glue gun to glue the cake base together. Be sure to line the X's up!! Now we have a nice sturdy base to hold up that cake! Now it's time to cover the cake base with cake foil. 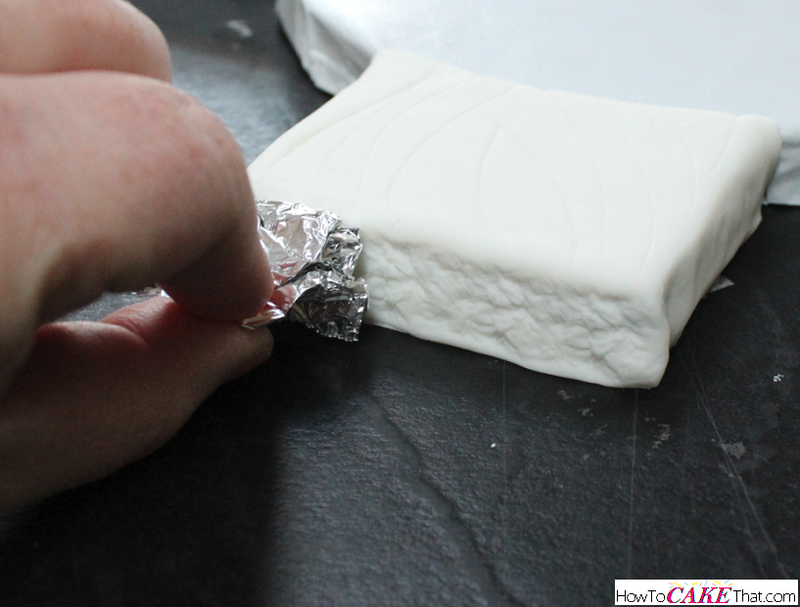 I'm using Wilton's white cake foil for this tutorial. 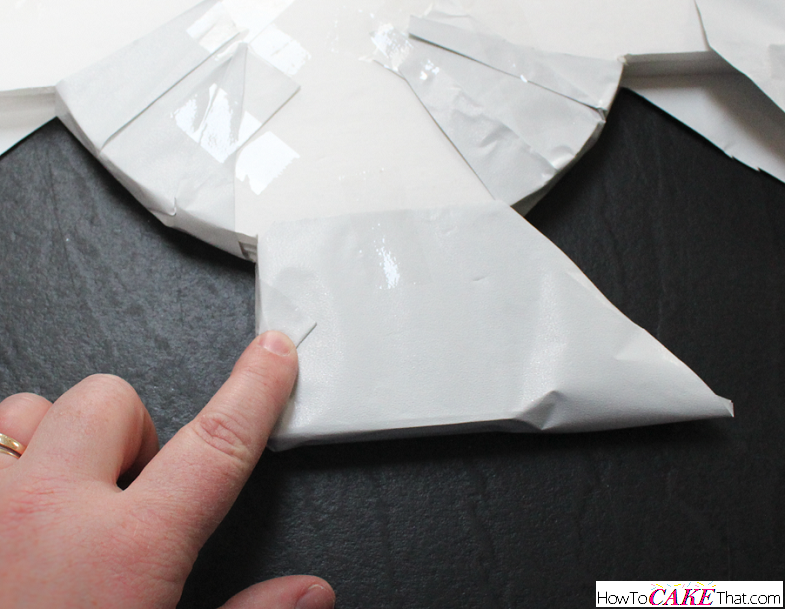 I placed the cake base onto the back side of the foil and used scissors to trim away the excess foil. 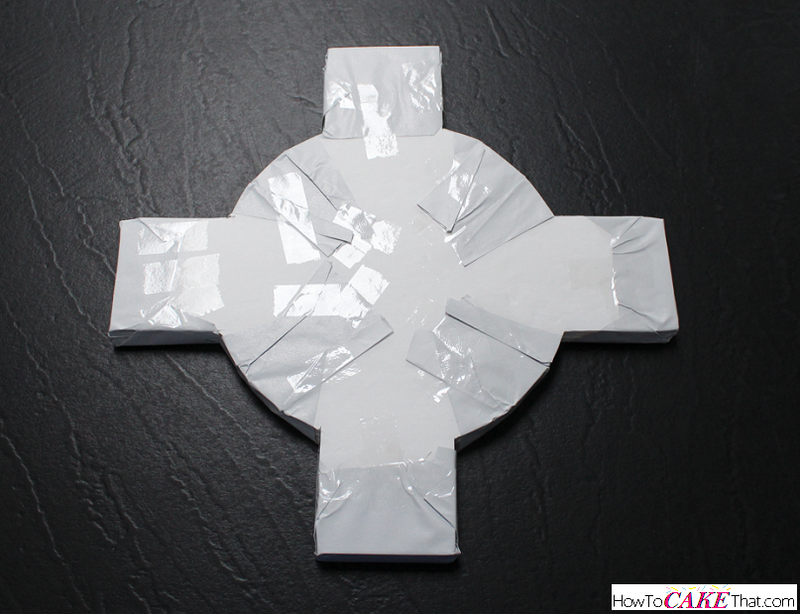 Be sure to leave enough foil to allow for folding over the edges and sides. 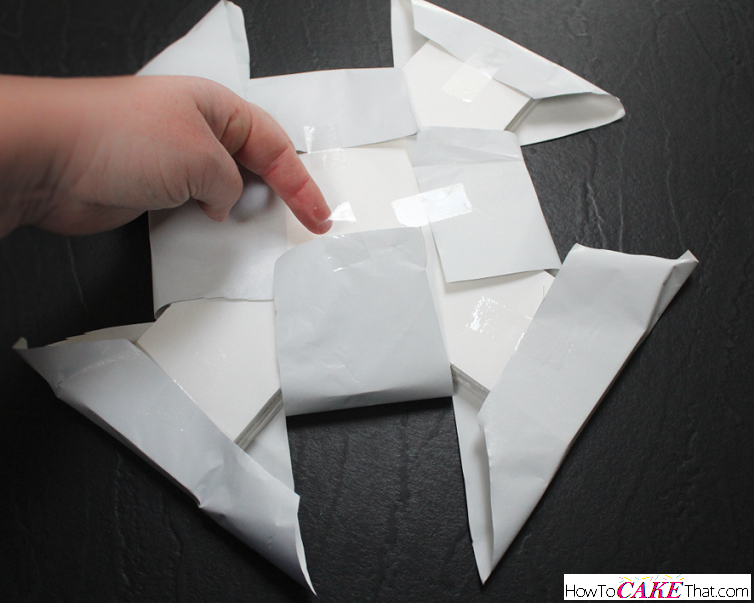 Wrapping odd shapes like this can be a bit tricky, but hopefully these photos will make it a breeze for you! 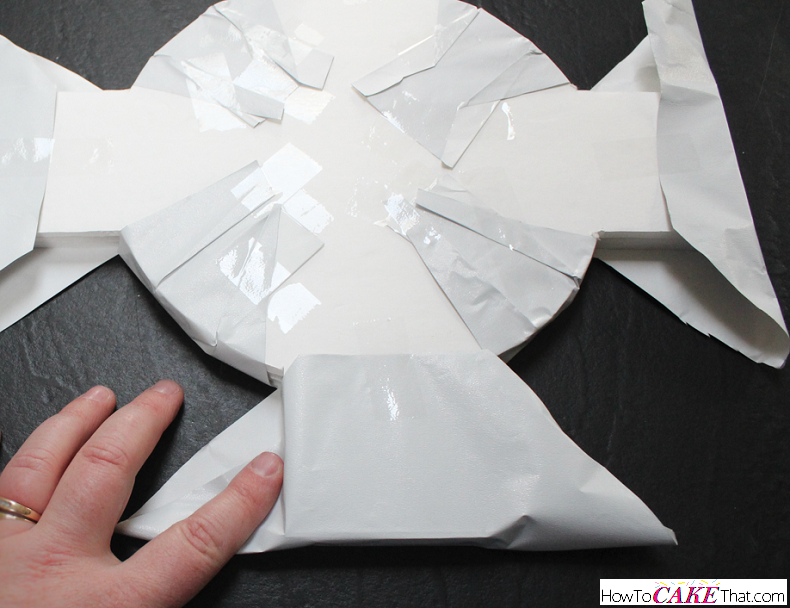 I began wrapping the cake base by folding the foil over the ends of the cake base feet and taping them in place. Then i used scissors to cut straight lines toward the round center of the base to create a flap that could be folded over the center of the base. Tape in place. Next, I did my best to pull the foil tightly around the round edge of the cake so it would fit nice and snug, and then taped it in place. 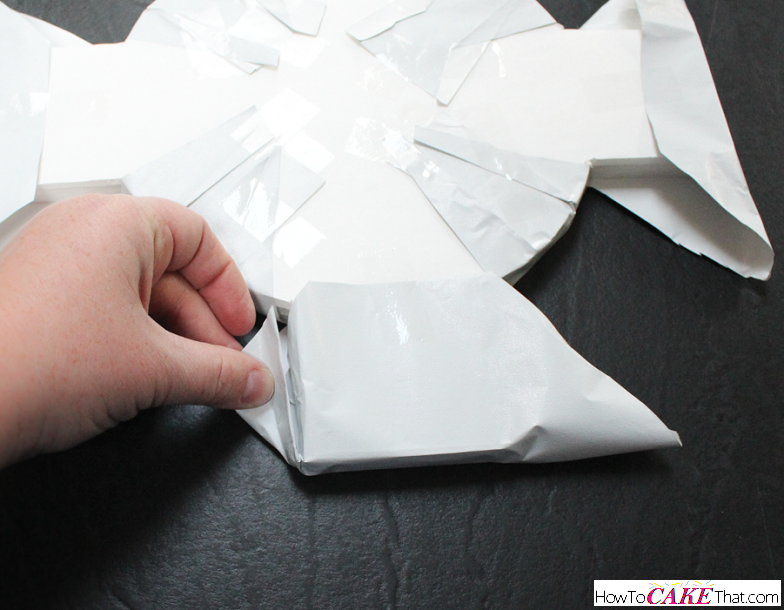 Then, just like the ends of a wrapped gift, I pressed the foil on the sides of the feet down to create a flap. Then I folded the flap over itself to make it smaller. 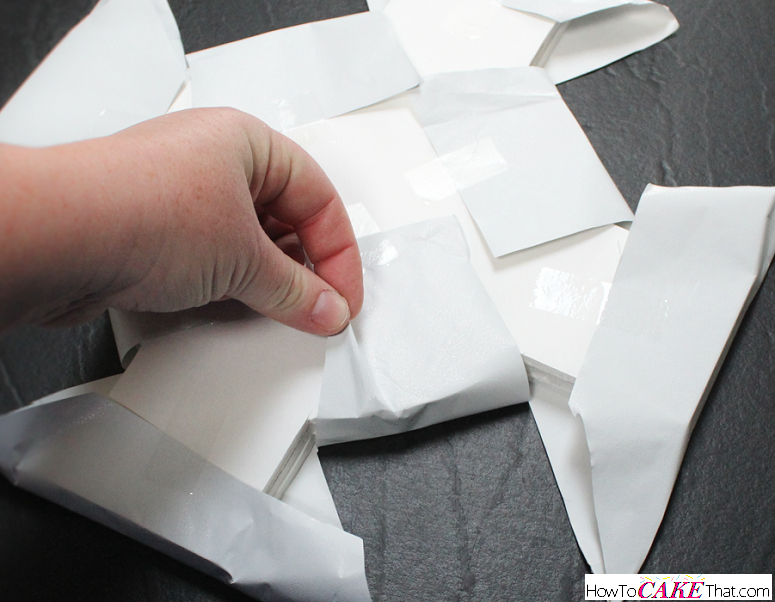 Then I fold it up and tape it in place. Don't worry if some of the foam board underneath shows a bit on the sides. It will all be covered eventually. Yay!! Nice and tightly wrapped! Now it's time to add the fondant to the cake base. And to keep from wasting fondant, we will only be covering the feet of the cake base. 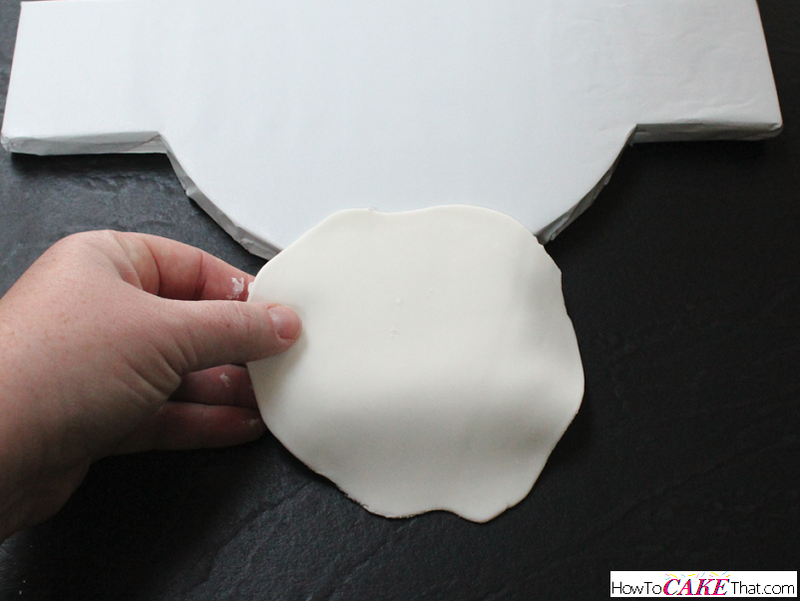 Roll out a little fondant large enough to cover one of the feet of the cake base. 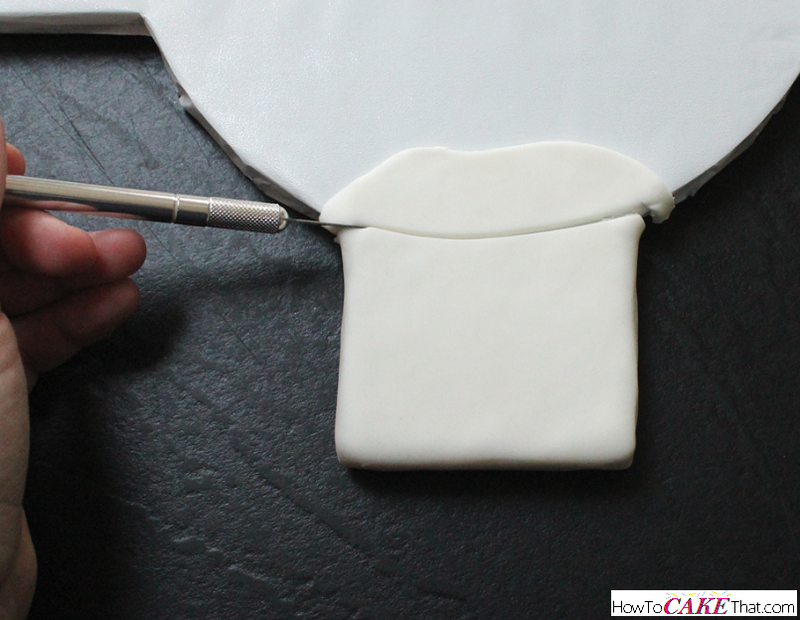 Brush one of the feet with piping gel to help the fondant stick. 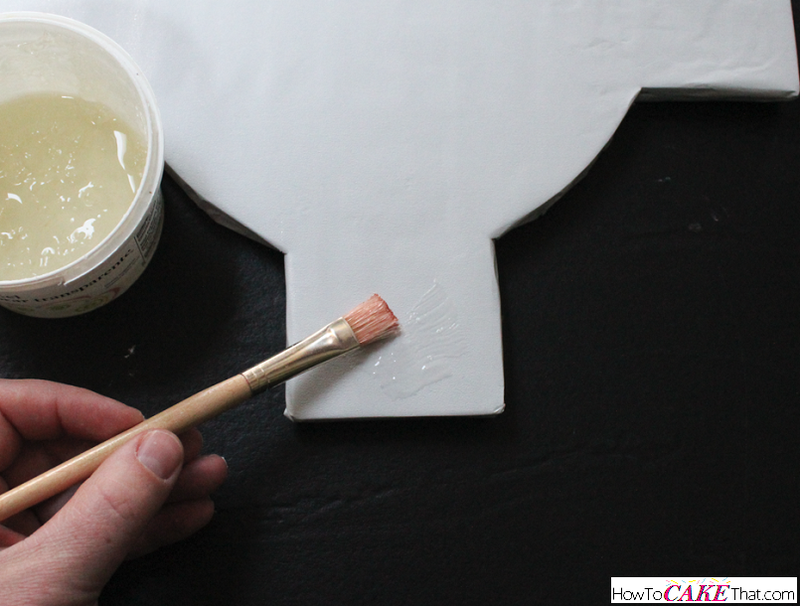 Be sure to brush the top and sides with a nice thin even coat!! 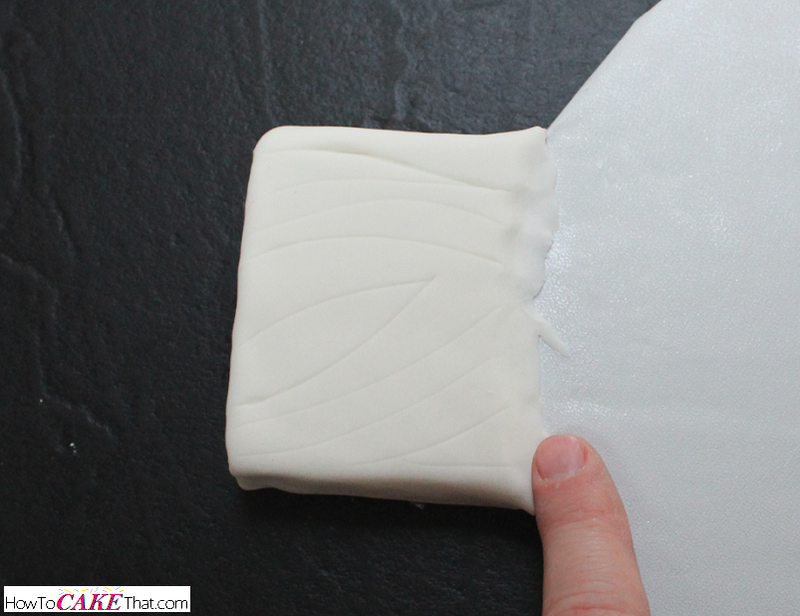 Then drape the piece of fondant over the cake base foot. 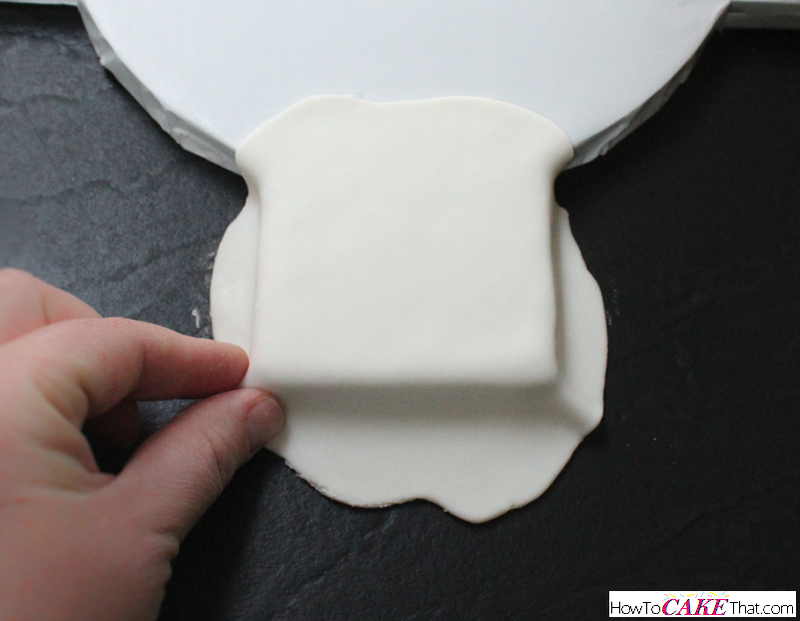 Use your hands and fingers to smooth down the fondant and shape around the cake base foot. 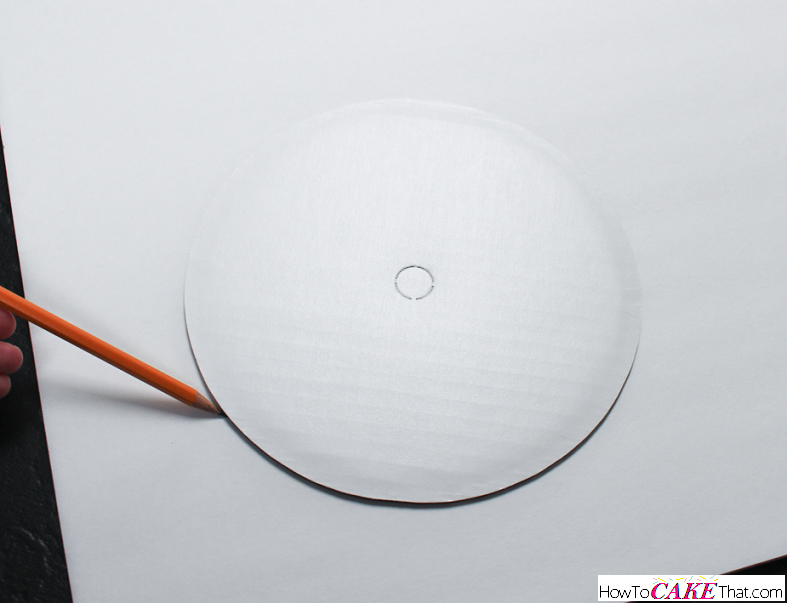 Use a needle to pop any airbubbles that may appear. Be sure to press the fondant tightly against the sides. 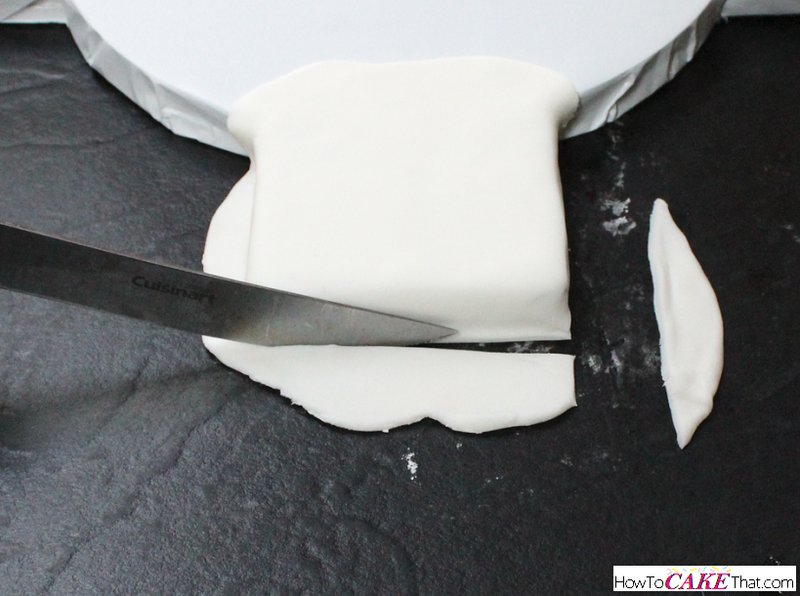 Then trim away the excess fondant with a sharp knife. 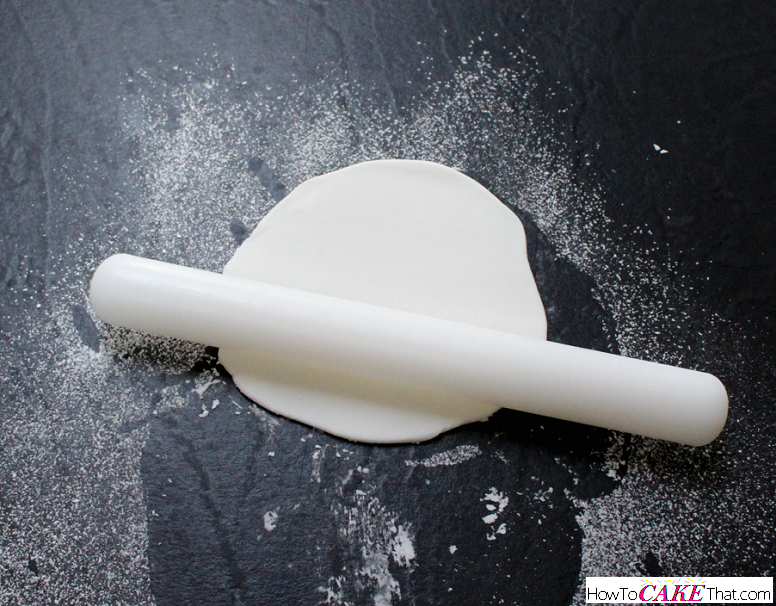 When cutting the fondant, do not pull and drag the knife... this may stretch and pull the fondant. 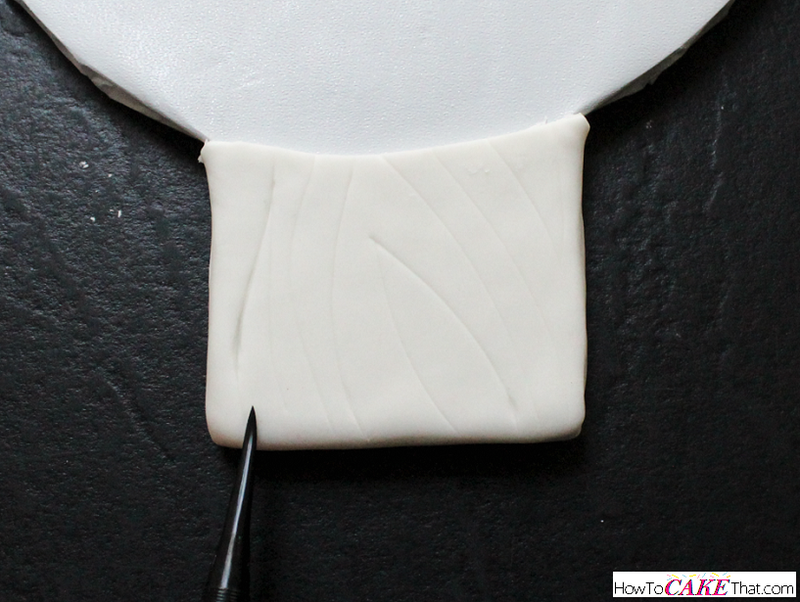 Instead, line the knife up with the edge of the cake base foot and roll the knife blade to cut the fondant. Next, I used an Xacto knife to trim away the extra fondant on top of the cake base. Then I used a pointed veining tool to draw in a wood pattern. Wood patterns are pretty easy to create! Just draw a wavy line pattern where the lines somewhat follow each other. If you need help understanding how a natural wood grain flows, Google search "Wood grain clipart" and you will see nice patterns to follow. The end of cut wood is never smooth! So we need to create a rough texture. What easier (and cheap!) way to make it than to use aluminum foil?! For this tool, I crunched up a piece of aluminum foil so that it had a nice rough texture. Then I pinched a little handle on the back so I could easily press it into the end of my cake base foot. And lastly, smooth down the back part of the foot so the cake can sit on the center of the base without any gaps. 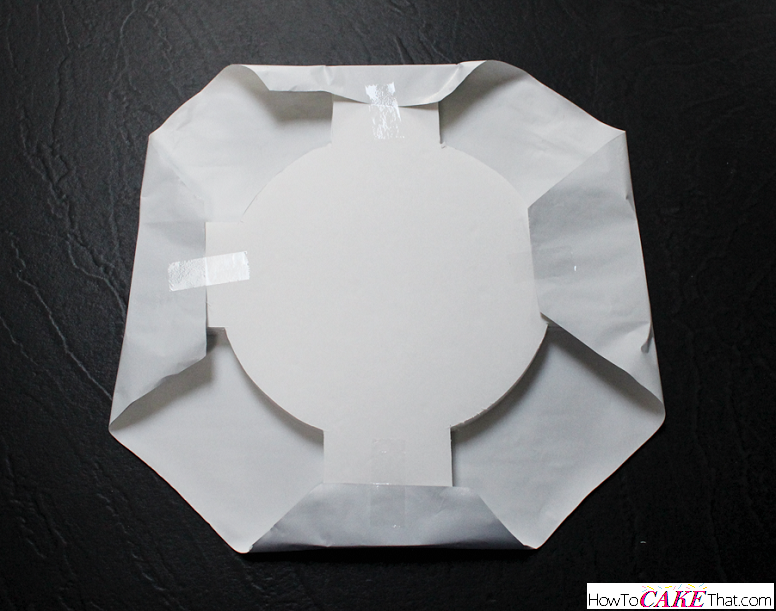 Set the cake board aside in a safe place to dry at least overnight or a couple of days. Now it's time to learn how to make the pine needles!! Click the button below for the next page.